A media maelstrom surrounds the early morning jaunt by golfer Tiger Woods as he sped down his driveway on November 30 and somehow ended up in the street semi-conscious. 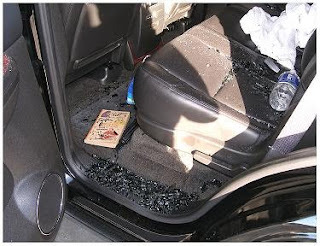 As fascinating as this frenzy of the press is, it’s even more captivating to learn of the paperback book found amidst the broken glass on floor of Tiger's Cadillac Escalade - "Get a Grip on Physics" by John Gribben (see inset photo). Imagine that, Tiger reading a physics book that talks about the basics of physics from early developments through the latest subatomic particle discoveries and string theory. Maybe Tiger needs to know Newtonian mechanics to determine the optimal force necessary for this 400 yard drives. Or forget about allegations of an extramarital affair, maybe his wife Elin simply caught him reading the physics book a clocked him with the golf club to get him to stop. I've heard of being anti-science, but hey, this is going too far! This is hilarious! You find the kulest stuff, thanks! It must be Tigers book, can't see Elin reading it. Why is it you "can't see Elin reading it"?